Multiple copies of the LA Times were strewn across our apartment floors for a couple of weeks. Perhaps it’s not in good taste to explain why in a food post. At any rate, the food section has provided some inspiration for baking the last few weeks. I’ve not had an upside-down cake for ages; not since childhood days of being allowed to make pineapple upside-down cake unsupervised. So it was with great glee that I made a lemon upside-down cake a few weekends ago for my BBQ. It allowed me to get all sorts of things going on the grill and make a cake at the same time. Recipes should always be this easy. Unfortunately, no photos were taken. A usual. You must think I fake these posts… I was going to link to the LA Times recipe, but found it’s a pay-per-view article. Well, sod that. I’m not going to reproduce it here, because I’ve no doubt there’s some copyright law on that. So, there goes my stupid plan of using this blog as my recipe archive. 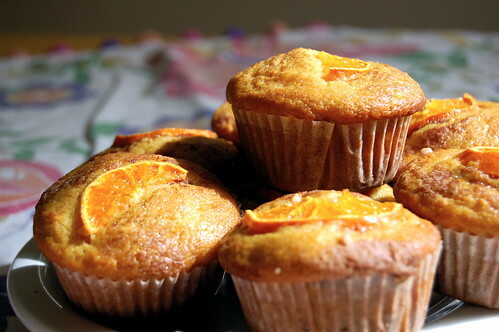 To make up for a lazy Sunday of frozen waffles and blueberries, I got up early to make muffins on Wednesday. (If it was a lazy Sunday, does that make this a working Wednesday?) The recipe, again, was courtesy of the LA Times, so no link. It called for Meyer lemons, but we’re swimming in mandarins at the moment, so mandarins it was. I like recipes that don’t faff about too much during the prep stage. This one required the citrus to be roughly chopped, then food-processed, which wasn’t overly complicated for early morning. 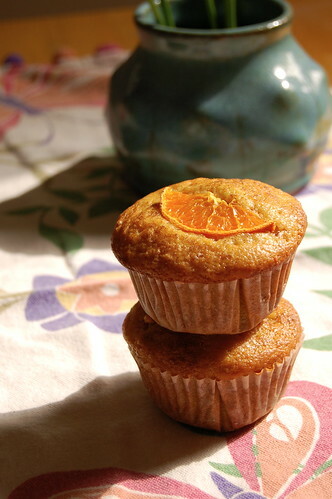 The rest of the muffin recipe was the usual simple stir-wet-into-dry-but-not-too-much. I don’t think I’ll use this recipe again. It called for 1/2 cup of butter, which, compared to that epicurious recipe from before, is 1/2 a cup of butter too much. (Maybe the banana in the previous recipe added enough moisture and good fat to hold the whole thing together.) But I like the idea of using my spare citrus in this manner. Perhaps I could bastardise the two recipes and come up with something edible, yet P-heart-friendly. More experimentation beckons. This entry was posted in akatsuki eats and tagged brekkie. Bookmark the permalink.